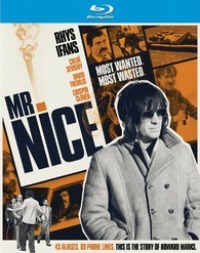 Directed by Bernard Rose, the film stars Rhys Ifans, Crispin Glover, and Chloe Sevigny, and tells the story of Marsh, a Welsh smuggler who has become known to the world as renowned pot dealer, Mr. Nice. From his time as a low-rate dealer, to his rise to one of the world’s best known, all the way to his fall directly into a long-term prison stint, Howard Marks lived a life full of moments that should for all intents and purposes make a brilliant film. Too bad we got this dreadful mess instead. Rhys Ifans is the film’s truest star, giving a performance worthy of a truly better film. Ifans plays our lead, and gives a fine performance that itself seems out of place. Laughably miscast in the opening portions of the Mr. Nice, often looking at least twice as old as his character, the shock value of the casting choice softens as the film goes along, which can in fact be said for the film itself as well. Chloe Sevigny plays his love interest, and is equally miscast here, if not saved by her kinetic performance. She’s really fun to watch here, but isn’t asked to do much outside of look pretty and be seductive. There are a few occasionally heartbreaking moments she is a part of, but they feel a bit cheap and out of place. However, it’s not at the fault of Sevigny, quite the contrary actually. Writer/director Rose is to blame here, for what can best be described as one of the most innocuous and inconsequential biopics we’ve gotten in quite some time. In the vein of other anti-hero biographical pieces such as Che and Carlos, the film looks at a man looking to make a name for himself. However, despite not being based on any revolutionary life like those aforementioned masterpieces, this film lacks the kineticism or raw style that made them both inherently watchable. Instead, Rose imbues this film with a stoner’s pace, and an equally mellow palette, making for a film that doesn’t quite make much of an impact come its final act. Almost meditative in the nature of its pacing, like the camera was fueled by a horse tranquilizer, it is how sedate the film is that makes it ultimately sloppy. Toss in a fine soundtrack and you have a film that is far from hard to watch, but for those who do, won’t be rewarded. Rose is a fine filmmaker, as seen in various well composed and framed shots here, but ultimately he doesn’t, visually or on the page, give the viewer anything remotely resembling a reason to continue on this journey with a man whose life is far from cinematically interesting as one would have expected. At least in Rose’s hands. Fine. The transfer, as should be expected, is superb, and the soundtrack really shines. The dialogue had a few hiccups and seemed to be awkwardly tuned within the overall track, but it wasn’t a huge issue. Non-existent. A making of and a trailer, with the former being your standard studio shot drek. David Thewlis’ performance as an IRA member. He’s the only bit of energy the film has, and is a breath of fresh air within this otherwise muted, slowly paced, and intellectually vapid piece of cinema. Overall, Mr. Nice is far from a bad film. Not a film that you’ll ever feel bad about watching, or will want to watch again, Mr. Nice is as harmless as they come. Featuring not a single performance worth its weight in gold nor a single intellectual bone in its body, the film is entertaining and watchable, just not anything to chew on. It’s like a tub of popcorn. Full of goodness while watching the film, but ultimately disposable during the credits.